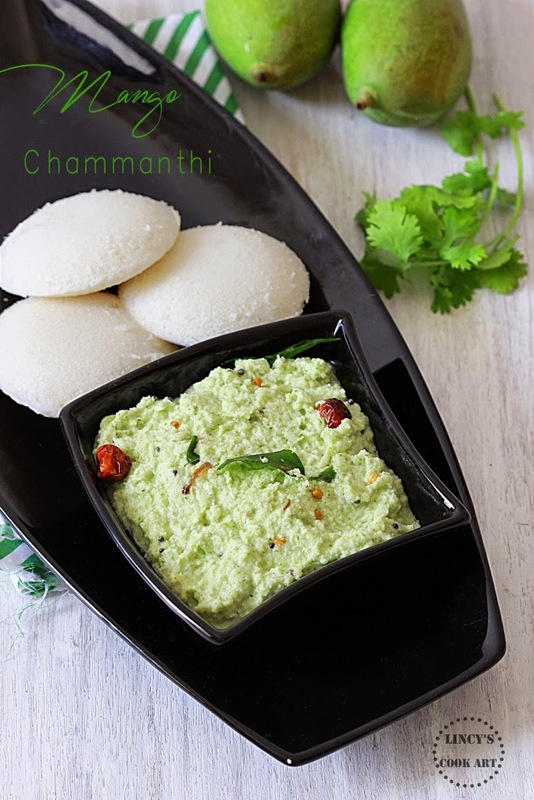 Green Mango Chutney | Thogayal | Chammanthi: I had been preparing Mango Chutney two ways; one was using green chillies and the other one with dry red chillies. The red chilli version taught by my neighbour will be shared in a later post. Both versions go well with idli dosa and with rice. When prepared for rice add less water while grinding and no need for tempering. The tangy taste from the mangoes gives a different dimension to this normal chutney. This is a traditional Kerala chammanthi recipe. Really a flavourful chutney to be prepared during this mango season. The chutney looks similar to normal chutney but the taste and flavour varies from that of a normal chutney. Peel the mango and chop them to pieces. In a blender jar add the chopped mangoes, green chillies, coconut, coriander leaves, garlic/ginger and salt and blend to grind coarsely. Now add some water and grind as a fine or coarse paste according to the texture you wish. Heat oil in a pan and add the mustard seeds, urad dhal once the mustard seeds splutters; and as the colour of the urad dhal starts to turn golden add the dry red chilli with the curry leaves together; fry till crispy. Add the tempering over the prepared chutney and mix well. Note: I used to prepare this chutney for idli or dosa with garlic and ginger for rice. I did not add tempering for this chammanthi when i prepared as an accompaniment for rice.